Question: What do Olympic Gold Medallist Ben Ainsley, Irish Olympic Sailor Ciara Peelo and over 85% of all the Medal winning sailors at the Beijing Olympics have in common? Answer: Yes you guessed it they all learned to sail in an Optimist. Ciara Peelo was an Optimist sailor only a few short years ago, Ben Ainsley sailed his Optimist until he outgrew it at 14 years old. 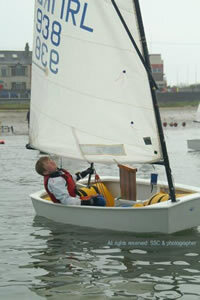 The Optimist is really an excellent boat for a young person to learn to sail. It remains the only boat to be approved by the International Sailing Federation exclusively for sailors under 16 years old. Sailed by 150,000 Sailors worldwide in 110 Countries, it is the biggest dinghy class in the world, and the fastest growing. The junior section at Skerries Sailing Club is very active, with training sessions available in the spring and in the autumn. The summer months are mostly taken up with Regional and National events, which take place at various sailing clubs around Ireland. In Fact Skerries hosted the Leinster Regional Event in 2008. There is also many midweek and weekend racing sessions that run through the summer. Here the young sailors can race against each other in a very safe and fun filled environment, where the new sailors can learn so much from the more experienced. We are lucky to have Excellent Coaches in the junior section in Skerries, some of whom have sailed for Ireland in the Olympics. Optimist sailing provides a platform where Boys and Girls can compete on an equal basis, in fact the yearly rankings often show a 50/50 split. Typically the sailors start learning to sail at around 9 years of age ,but 11 or 12 years old is not too late to start, even to get to the top of the fleet. Young people can sail at whatever level they wish. Some may wish to follow the circuit of events around the country and some are happy to sail at home here in Skerries for the season. Either way, most parents find that sailing gives young people a great sense of personal achievement. At the very least they will have great memories of sailing in Skerries Sailing Club. Designed by Clarke Mills in Florida in 1947. Each boat is marked with a Blue numbered label called a ISAF Building fee plaque. This plaque, subject to measurement allows the boat to be sailed at events from local events to worldwide. Optimist is a One Design boat which provides a level playing field when it comes to racing competitively. So simply put if it doesn’t have the blue sticker it’s not an Optimist. There are a lot of lookalike boats in the market place and parents should be aware that these boats may provide an excellent low cost starter boat to learn to sail in, but they will not be permitted to race against other optimists in competitions. Each boat has a Registration booklet and measurement Cert. The Sail is marked with a unique sail number. There is over 1,300 Optimists Registered in Ireland in 2008. An optimist can be transported on top of a car fitted with a roof rack.